I have a secret to confess. I use men's shaving cream. Now, I could go through a whole litany of reasons -- it foams more than women's, it's better for my sensitive skin since they use it on their faces all the time, one can lasts longer than a can of women's shave gel, my mom only has to keep one can in her bathroom cabinet for both my brother and me. But here's the real reason I use it. It's cheaper. And we're not talking just a few cents here or there -- we're talking at least a dollar less than any women's shave gel for at least three more ounces! I used to be a huge fan of Skintimate shave gel. I tried every scent and loved them all. But then I realized that each sweet-smelling can has about 8 ounces -- and Gillette Foamy Shaving Cream for Sensitive Skin has 11 ounces! And if I'm being completely honest, I'll just tell you this. I really do love that Gillette can. It lasts me for months no matter how often I shave and how much I squeeze out, and it makes my legs seriously smooth, leaving behind no trace of razor burn and a comforting, menthol-like aroma. Try it -- I swear you'll thank me. 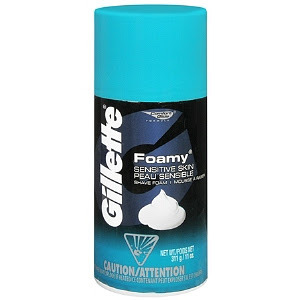 Gillette Foamy Shaving Cream for Sensitive Skin retails for $3 at drugstore.com. Jamie, me too!! I find it actually stays on my legs better in the shower, plus like you said it's cheaper and lasts longer. I love the Gillette Lemon-Lime scent, it smells so sweet and fresh. It's getting harder and harder to find though, so hopefully they haven't discontinued it. Oh my gosh, I hope it's not going to be discontinued! This is hands-down the best shaving cream I've ever tried!